Monitor servers and network devices. Is there a better alternative to iCacti? Is iCacti really the best app in Network category? Will iCacti work good on macOS 10.13.4? 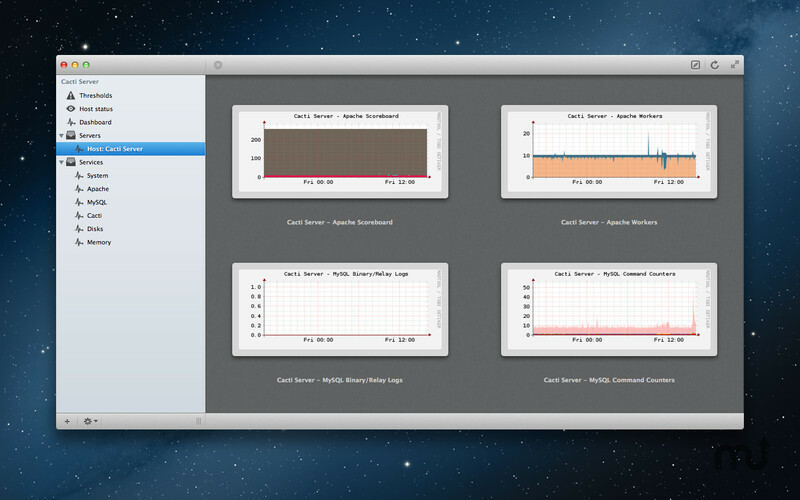 iCacti helps you to monitor servers - Mac, Linux, Windows - and your network devices - printer, router, switch - activity, status and uptime and display historical graphs about them. The application access your remote server or computer and natively displays graphical information on your desktop. It alerts you when any of the monitored hosts become unavailable or a server resource reach a threshold limit. iCacti needs a review. Be the first to review this app and get the discussion started! iCacti needs a rating. Be the first to rate this app and get the discussion started!